On August 11, 1904 Maud Duke, daughter of S.V. and Nancy H. Duke passed away at the age of 19. An exquisite statue of a young girl with bouquet of flowers in her arms was erected at her grave to mark her passing. 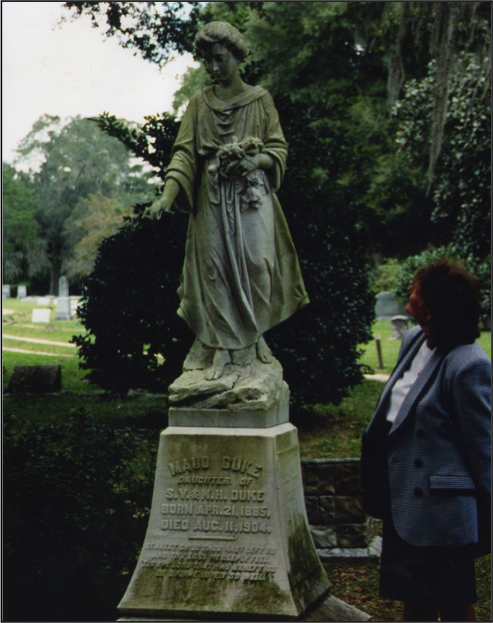 For over a century she stood, forever young, in Evergreen Cemetery’s “Old Yard”… a tribute to a family’s deep love and profound sorrow. As part of this exhibition project, the City of Gainesville has commissioned a new marble statue to be sculpted in Italy in homage to this lost treasure. It was erected April 14, 2013 near the entrance to the Old Yard, where Evergreen Cemetery was founded in 1856, just feet from where the original “Maud” once stood. Bearing a likeness to its predecessor the monument will be named “The Spirit of Evergreen” and once again take its place as a symbol of all whose hearts and souls are intertwined with This Wondrous Place.